Ge-68/Ga-68 generator is used in nuclear medicine to produce positron-emitting radionuclide Ga-68. 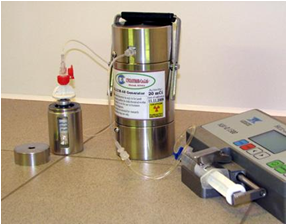 The parent isotope Ge-68 has a half-life of 270.95 days and can be easily delivered to hospitals as a generator, where it can be used as the source of Ga-68 for at least 1 year. Gallium-68 (with a half-life of only 67.71 minutes, difficult to transport) can be easily eluted from the generator any time at the site of application and can be used for different purposes. The Ga-68 generator of a chromatographic type is a glass column with a sorbent based on modified titanium dioxide. The parent radionuclide Ge-68 is fixed on this sorbent. The column is placed into the lead shielding container and provided with eluent and eluate lines. Ga-68, which is generated as a result of Ge-68 decay, is eluted from the column by 0.1 M HCI. Parent isotope's activity: 10 mCi (370 MBq), 20 mCi (740 MBq), 30 mCi (1110 MBq), 40 mCi (1480 MBq), 50 mCi (1850 MBq) and 100 mCi (3700 MBq). In agreement with the customer we can deliver a generator with other activities of Germanium-68. Overall generator's dimensions in the security container: diameter 90mm, height 188 mm. Equivalent dose rate at any point of the security container's outer surface: <0,8 mSv/h (<80 mrem/h). Equivalent dose rate at the distance of 1 m from any point of the security container's outer surface: <0,01 mSv/h (<1,0 mrem/h). The elute of Gallium-68 is 0.1 M HCI. Ga-68 yield in 5 ml of eluent is at least 75 % at the first run and at least 45% throughout 3 years or after 400 elutions. The breakthrough of Ge-68 is not more than 0.005 %. The column is placed into a lead security container of the KSU-2NZH-M generator standard set. The generator is certified in the certification system for equipment, products and technologies for nuclear installations, radiation sources and storage (OIT-certification system). Ga-68 obtained from this generator can be used for PET systems calibration, for making phantoms and for the development of labeling technique.